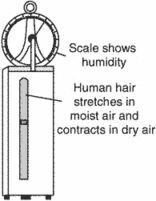 An instrument to measure humidity. It uses one or more human hairs, which are held under tension by a spring. The length of hair increases or decreases, depending on the prevalent humidity. Also called a hair hygrometer.